Eoin Morgan (R) will lead England in what is their best chance to win a World Cup title. Eoin Morgan (c), Jos Buttler (wk) (vc), Moeen Ali, Jonny Bairstow (wk), Tom Curran, Joe Denly, Alex Hales, Liam Plunkett, Adil Rashid, Joe Root, Jason Roy, Ben Stokes, David Willey, Chris Woakes, and Mark Wood. Morgan, Buttler, Ali, Hales, Root and Woakes are the only players remaining from England's doomed 2015 Cricket World Cup campaign. The squad is heavy on experience and continuity, as most of these players have been a part of the ODI setup since 2015. 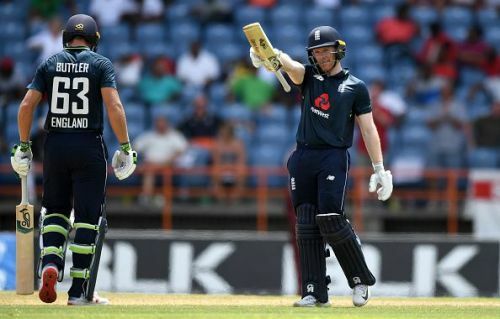 It has most bases covered, with England looking to resolve the identity of a second reserve batsman and also waiting on whether Jofra Archer can be accommodated in their plans. Jason Roy and Jonny Bairstow are currently two of the most destructive opening batsmen in the world, with both of them seemingly scoring centuries for fun in 2018. Roy also holds the record for the highest score by an England batsman with 180, breaking the record set by Alex Hales. Bairstow has two of England's fastest ODI centuries (54 and 58 balls respectively) and has been in good form in the ongoing IPL season. Hales is currently the designated backup batting option and can play either as an opening batsman or at No. 3, with Root dropping to No. 4 in the lineup if needed. Root and Morgan follow at No. 3 and No. 4 respectively, batting to either set up a platform or continue the aggressive approach. While Root has been scoring runs consistently, Morgan alternates between patches of heavy run scoring and poor form. He should not be too worried about his place in the lineup if his 2018 form (7 half-centuries in 22 innings) continues though. Stokes, Buttler and Ali provide lower order aggression after Root and Morgan. Stokes has had a mixed run of form since his suspension and appears to have taken on more responsibility in his batting since, but is still an aggressive option with the bat and ball while also being among England's best fielders. Buttler is also the designated vice-captain and possibly future ODI / T20I captain of England, with Morgan reportedly considering his future as captain after the World Cup. Adil Rashid plays as England's wicket-taking option during the middle overs. 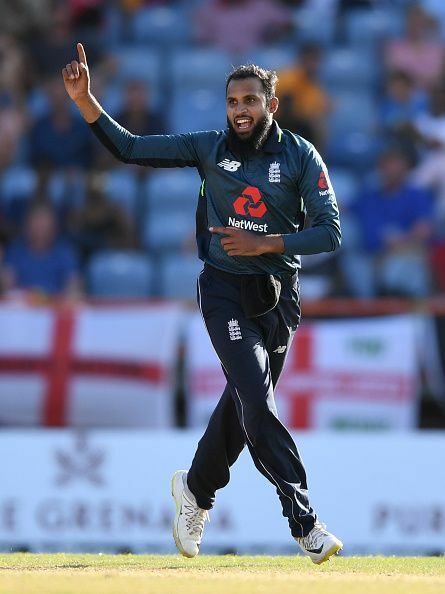 Chris Woakes and Adil Rashid are England's leading bowlers, with Woakes bowling upfront with the new ball and during the death overs, and Rashid bowling in tandem with Ali during the middle overs. Rashid has one of the best records for a bowler since the 2015 Cricket World Cup, having taken 125 wickets in this period. Liam Plunkett is also a threat during the middle overs and has one of the better records since the last World Cup with 77 wickets. However, a dip in pace and a recent run of poor form has left his position in the lineup vulnerable. Mark Wood, David Willey and Tom Curran are all competing to open the bowling alongside Woakes, with each offering different advantages. Wood offers genuine pace, Willey offers a left-arm angle and is dangerous when the ball is swinging, and Curran offers excellent death bowling, pace and batting ability. Joe Denly has been selected as backup spin bowling option but has not played a game since he was selected last year, meaning his place in the team is more liable to change than anyone else's. Chris Jordan and Jofra Archer have been selected separate from the World Cup squad, for the ODI matches against Ireland and Pakistan. Both are in contention for places in the final World Cup squad. England are planning to use the matches against Ireland and Pakistan to see how Archer adapts to international cricket and to identify a second reserve batting option. The places of Plunkett, Wood, Curran and Denly are the most under threat, especially if Archer or Jordan have a good run of form while the others do not. Sam Billings and James Vince are the leading contenders for the second reserve batting option. England's aggressive batting approach and a multitude of bowling options (at least seven) in the playing XI are their biggest advantages against other teams, particularly on flatter wickets. Improved batting against spin bowling has also worked in their favor, but their batting is still susceptible to swing bowling, which is something the other teams will look to exploit. A consistent run of form is what England will be looking to achieve. They have often played well in one match only to play horribly in the next one, and while the group format allows them to have a bad day or two, it is something they will be looking to avoid. Avoiding injury is also something England will be looking to avoid, with Woakes suffering from a chronic knee problem and Wood having ankle problems. Prediction: They can and should win the World Cup if they perform to their potential.